and won the "Hi-Yo Silver Away Contest." I must thank my mom for pushing me into theatre classes at MacPhail to work on numerous speech impediments. Then the community stage took away the shyness associated with growing up an only child. I found joy in entertainment. I started performing. I started writing. My collegiate years brought me to the Playwrights Lab. My unique voice made me explore physical comedy -- commedia dell'arte, pratfalls, slap-schtick, clowning. The Art of Mime. Communicating via silence. But I still longed to sing and dance, do theatre, and I did...tackling Shakespeare rhymes, Neil Simon jokes. Writing scripts, winning awards, and dabbling in my secondary love of journalism. Like many in the World of the Arts, I married (met my first wife via theatre) and produced children and went into the real world, writing for the major daily newspapers, then working in public affairs policy and executive conferencing and education. don't you dare shut off the spotlight. 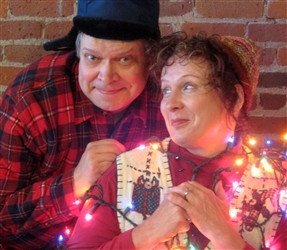 (pictured above) COME SEE JOEL AS OLE AND LYNN MAIERS PAULSON AS LENA IN "AN OLE AND LENA CHRISTMAS" PLAYING NOVEMBER 26th thru DECEMBER 30th AT THE FUNSIDE DINNER THEATRE IN STILLWATER! Comfortable in front of the camera as well as on the stage! The Art of Performance starts with the Simple Exchange of Ideas. A Conversation. A Story to Tell. Some Players. Direction! A Stage or a Screen! 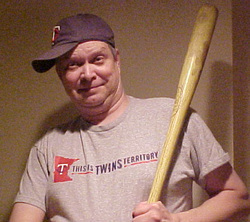 project if you can find a place for a large-sized aging Actor (who can play 40s to 60s) and will be a part of your team. I've been all over the Acting spectrum. Yes, been there, done that. But I find that Acting is a constant learning experience. I'm still exploring Acting. Still practicing acting technique, improvisation, listening, acting uncontrollably mad at times, sullen and serene other times, guffaws and snorting up a storm of laughter when one least expects tomfoolery. I have always loved Performance Art. Reacting with the audience to create emotion, to tell a story, to Make That Moment! a timely manner to a job prepared for work, with ample costume choices. I'll transition between film and stage with ease! Thank you for visiting and I hope we can work together! Risa is a painter and her work can be found at www.createdbyrisa.com. Both share Studio space at the Jax Building, where Joel deals with popular culture artifacts from his youth in the world of auctions and art. Their adult children (Noel and Bree, Cyrus and Ana) still reside in Minnesota.